As mentioned in the previous post about the Bawsey Bumps, "we would really really like" an alternative to the B1145 Bawsey Bumps which is currently the most-used route for cycling east. It's horrible but the alternatives are even worse, involving a very long detour such as 35 miles south to Brandon or mixing it with heavy traffic on the A47 or A148. The Lynn and Fakenham Railway originally ran to South Lynn, passing between the south edge of the current Hardwick Narrows industrial estate and the north edge of West Winch Common. That route is drawn in pink on the map. I'm assuming that access will be provided from the old level crossing at the top of the A10 because it seems so obvious - while that's useful for people coming from south or west of Lynn, it's not great for most of the town and will lead to the route having unrealised potential. So what are the other possible connections? The northernmost option would be to follow the branch line that led to the station where Priory House in Austin Street stands now, at least until we get close enough to the current cycleway network at the Reffley-Springwood Path - although they should go further to near Dairy Way on Wootton Road and make a proper crossing to Marsh Lane. The advantages of this include that it keeps the historic railway link, it looks like the trackbed has not been built on until you're almost at Wootton Road and it would offer a direct access for Reffley and the Woottons - but it is the longest link, it would need a new crossing of the bypass, it's not great for getting from the villages to the hospital (a major employer that people from the villages probably would like to cycle to) or getting from most of town towards the future Bawsey Country Park or Fakenham, and the crossings of Wootton Road to reach Route 1 would need improving if we want to encourage cycle-commuting between Grimston and King's Lynn. The central option would be to extend the Gayton Road cycleway out of town past the crematorium at least to the Spot Lane crossroads and possibly to the Bawsey level crossing. This section of road is fairly straight, the highway corridor looks wide enough for at least a 3m cycleway, one of the neighbouring landowners is the borough council who have various policies in favour of cycling and it would be much more obvious to people starting cycling than a junction from an existing cycleway up the back of Reffley. 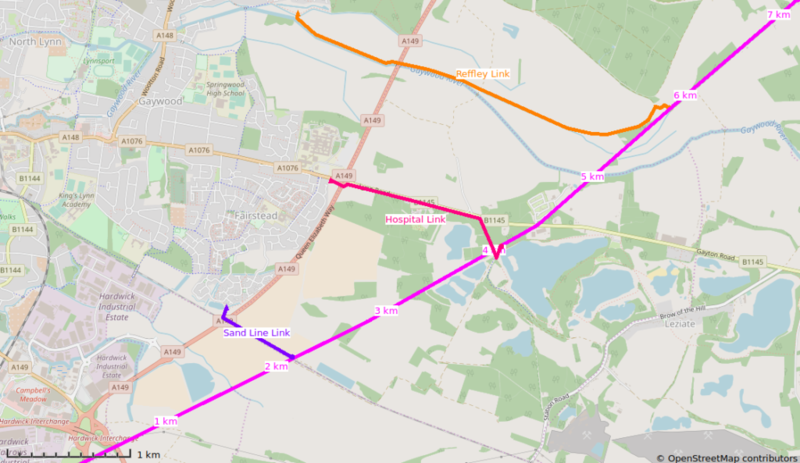 It's great for the hospital and connects to most of the town in fairly obvious ways, but it's not quite as direct for Reffley and South Wootton and most of the Gayton Road cycleway needs upgrading to meet current standards. The biggest challenge here would be to fix the horribly dangerous cycle crossing of the hospital roundabout. A few years ago, the roundabout was rebuilt to be a spiral-lane design and an uncontrolled crossing added to the south arm which means you get 3 seconds to cross 2 merging lanes of 60mph motor traffic and then still have to cross 3 lanes of queuing traffic. There are no warning signs or road markings telling approaching motorists to expect people crossing. The signs on the crossing island have been damaged repeatedly by crashing motorists. Unsurprisingly, many of the cyclists willing to brave the Bawsey Bumps stay on the carriageway and ride around the fast spiral roundabout, but that doesn't encourage people to start cycling. The southern option would be to follow the Sand Line from King's Reach, under the bypass and join the Fakenham Line where it used to cross the Sand Line. There are already tracks around the King's Reach balancing ponds pretty close to the railway. This is by far the shortest option - about half a mile of new tarmac - but the very substandard cycleway from King's Reach to the Sand Line path at the Iron Bridge would also need upgrading to cope with the extra traffic and some disability-discriminating narrow-spaced bollards removing. Also, I'm not sure whether there's enough space under the bypass bridge and it's a live railway, so more fencing would probably be needed before Network Rail would agree - but potentially, that may mean dealing with mainly one landowner, who has to be involved anyway if the route towards the Hardwick is going to cross the Sand Line. 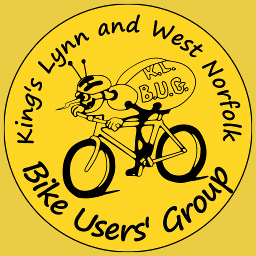 There are several ways that the Lynn to Fakenham Railway Path could offer an alternative to the Bawsey Bumps. As long as some direct link into King's Lynn is delivered in full to current standards, I think it will be a great day for the Grimston/Pott Row area. The only shame would be not to try!